here giving an interview concerning "Berlin tips for active visitors"
"You can of course sit on a bus with your camera ready, but you could kill two birds with one stone and combine sightseeing with exercise ..." Afterposten reports of holiday destinations where guided sightseeing running tours of varying length and intensity are offered like in Barcelona, Berlin, Budapest, Copenhagen, London and a number of cities in the USA as well. "European cities are famous for walking tours; but have you ever thought about taking a running tour? 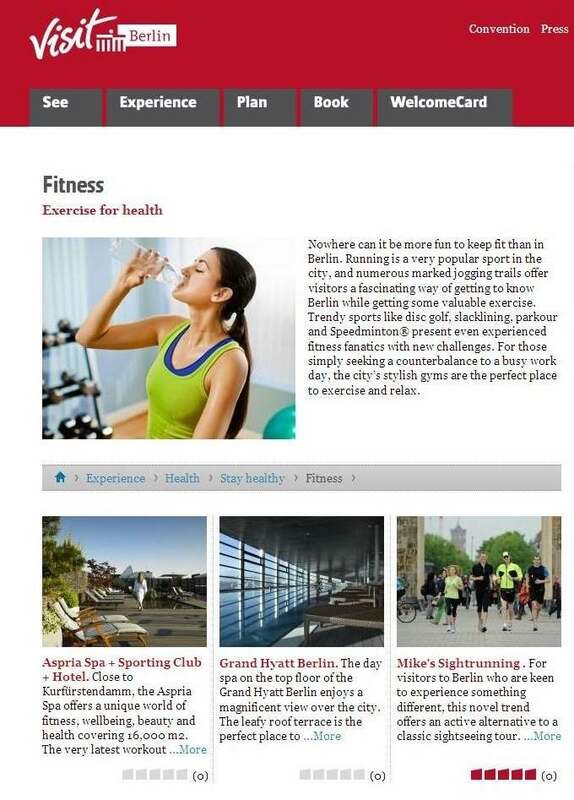 ... Berlin, Germany - You can choose what is best for you, since Mike's SightRunning Berlin offers several packages." "While most people love enjoying the walking tours many European cities have to offer, another great way to see the sights while running ... Berlin, Germany - Mike's SightRunning offers an array of themed small group running tours ..."
"For visitors to Berlin who are keen to experience something different, this novel trend offers an active alternative to a classic sightseeing tour. Running is a very popular sport in the city and numerous running trails offer visitors a fascinating way to learn about Berlin while getting some valuable exercise ... with Mike's SightRunning"
"If you are a runner traveling abroad, ..."
"you often don’t know where to go to enjoy a safe run and have a first glance at the new city. Once popular only in the United States, running tours are getting more and more popular in Europe: from Berlin to Paris, Rome to Istanbul, you can run a couple of miles or a few hours with someone who knows the best routes and all the popular landmarks of the city. 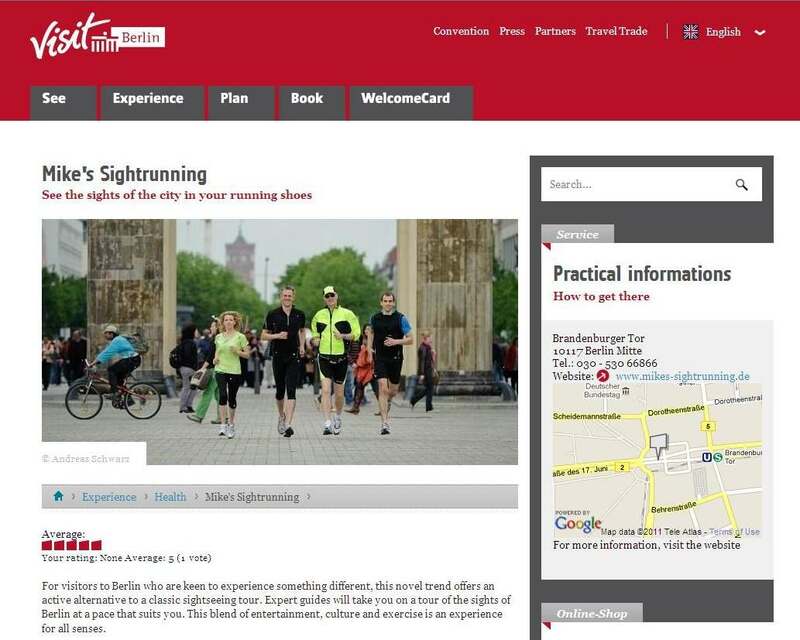 Mike’s SightRunning Berlin offers sightseeing tours around the German capital." "Here are five of the top running tour companies"
"Running tours offer a new way for fit-minded travellers to soak up the sights of a city... New city tours now mean that visitors can see the sights on-the-run ... and we do mean that literally. 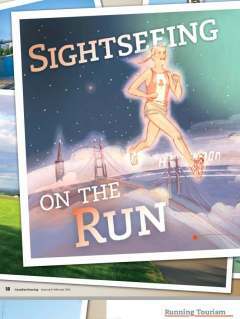 Running tours are the hot new way for runners to see the city sights. 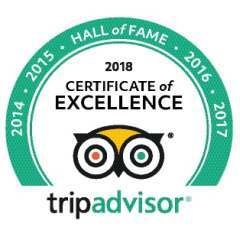 ..."
With answers to - Why Book a Running Tour? - and - Who Books a Running Tour? Berlin City Sightseeing Tours - How to Get Around - What Do You Want To See? "How you get around Berlin while on your sightseeing tour is entirely up to you. The many tour companies ... Mike's SightRunning Berlin offers small guided running tours that pass by many popular tourist sights. Each tour has a personal guide, and group sizes max out a just four people ..."